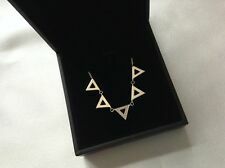 Thomas Sabo Sterling Silver Diamonds Triangle Necklace - Basic length of 45cm with adjustable chain for multiple lengths. Comes with Thomas Sabo Gift Box & Pouch in the current black design. Shall be sent via Royal Mail 2nd Class Signed For Delivery. RRP £198.00. This included ensuring watch batteries are in working condition. This included ensuring watch batteries are in working condition. NEW GENUINE Thomas Sabo Sweet Diamond Sterling Silver Four Leaf Clover Diamond Set Earrings SD-H0001-153-14 £125.00. This included ensuring watch batteries are in working condition. Our price: £62.50. RRP £69.00. This included ensuring watch batteries are in working condition. RRP £139.00. This included ensuring watch batteries are in working condition. This included ensuring watch batteries are in working condition. RRP £198.00. Genuine Ex Display Thomas Sabo Sterling Silver Ugg Boot & Diamond Heart Charm DC0022. Thomas Sabo price: £89.00. This included ensuring watch batteries are in working condition. This included ensuring watch batteries are in working condition. RRP £159.00. Thomas Sabo new collection. Real Diamond. not tried on. .THOMAS SABO CHARM CLUB. DC0030 “DIAMOND HAMSA HAND". RRP $129. THOMAS SABO CHARM CLUB. DC0030 “DIAMOND HAMSA HAND". _gsrx_vers_841 (GS 7.0.16 (841)). Thomas Sabo. THOMAS SABO necklace from the Sterling Silver collection. Dazzling eyes, an eye-catcher, a gentle gesture: as a result of the unique dazzle of the faceted dimaonds, this pave necklace embodies sweet love perfectly. THOMAS SABO Anniversary Diamond Bracelet from the Charm ClubCollection. 925 Sterling Silver. 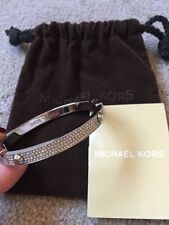 Oval belcher links with lobster clasp. 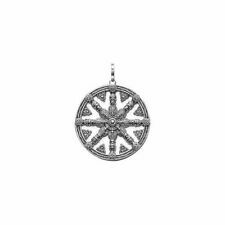 THOMAS SABO charm from the Charm Club collection. - White Diamond. - Width: 1.00cm. 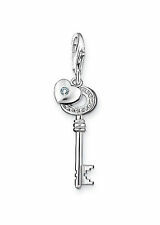 THOMAS SABO charm from the Charm Club Generation collection. - White Diamond. - Thickness: 0.16cm approx. 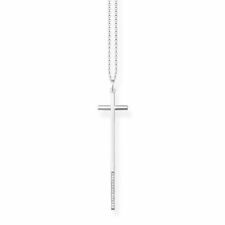 THOMAS SABO pendant from the Sterling Silver Collection. - White Diamond Pave. - 18k Yellow Gold Plating. All of our products are 100% genuine from the manufacturer. - 925 Sterling Silver. THOMAS SABO ring from the Sterling Silver Collection. Clear-cut style: this minimalist ring embodies the focus on the essential. Finger Size: 54. 925 Sterling Silver. Stones: White diamond. Size approx: 0.15cm (height). THOMAS SABO necklace from the Sterling Silver collection. - 925 Sterling Silver. - White Diamond Pave Set. - Length: 40 - 45cm. All of our products are 100% original from the manufacturer. THOMAS SABO ring from the Sterling Silver Collection. Clear-cut style: this cross-shaped ring embodies the focus on the essential. 925 Sterling Silver. Stones: White diamond. 0.15cm (thick). 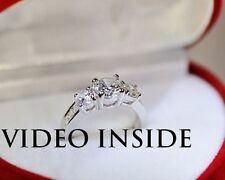 Genuine Thomas Sabo Sterling Silver Diamond Triangle Size 56 Ring D_TR0019. THOMAS SABO ring from the Sterling Silver collection. 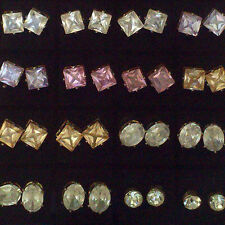 - White Diamond (Pave). - 925 Sterling Silver. Thomas Sabo. THOMAS SABO earrings from the Sterling Silver collection. Dazzling eyes, an eye-catcher, a gentle gesture: as a result of the unique dazzle of the faceted diamonds, this pave ear stud embodies sweet love perfectly. THOMAS SABO ring from the Sterling Silver collection. - 925 Sterling Silver. .THOMAS SABO CHARM CLUB. DC0032 “DIAMOND LUCKY CLOVERS". RRP $129. THOMAS SABO CHARM CLUB. DC0032 “DIAMOND LUCKY CLOVERS". _gsrx_vers_841 (GS 7.0.16 (841)). Charm Club Bracelet with Lobster Clasp perfect for Charm Pendants. High-quality bracelet made of 925 sterling silver decorated with white diamonds. Symbol of purity- Diamond dazzle- Floral cut-out designSymbol of love and affection: the filigree cut-out design of this small pendant with matching chain artfully recreates the image of an opening lotus flower. THOMAS SABO CHARM CLUB. _gsrx_vers_841 (GS 7.0.16 (841)). THOMAS SABO charm bracelet from the Sterling Silver Collection. Symbol of protection: this artful Nazar’s Eye with its cut-out design protects against evil. Sparkling, faceted diamonds create magical light reflexes and a hint of luxury.